One of the most critical tee shots on the course, coming into the fairway at a slight angle over a row of five bunkers on the right. Play too safely and you can run out of fairway, and into more sand, on the left. 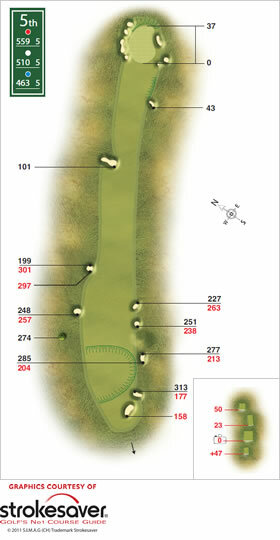 Down the prevailing wind the green is in easy reach, but the entrance is narrowed by bunkers left and right. In good conditions in 1992 there were 21 eagles and 234 birdies here. Into a headwind five years earlier it gave up just one eagle and 84 birdies.